I was privileged to be able to attend the ceremony up to placing the casket of the sacred relics on the Temple Tusker on Sunday night. I have attended the full perahera before to watch it to the end till the early hours of the morning, but I had not seen the events leading up to the placing of the casket on the elephant before. I was not an invitee to this event in the inner sanctum of the temple, though I had a VIP ticket to watch the proceedings. I was just a gate crasher and there was no one to stop me when I walked with an elbow crutch on one hand and a walking stick in the other!! When I walked in the Leader of the Opposition, Ranil who is the Chairman of the Dayaka Sabha was already there, as was a cousin of mine who is the chief dayakaya, actually she is the chief dayikawa and her daughter as well as the various Nilames including the Basnayaka Nilame. There were so many photographers in the inner chamber as well as TV camera men it was a hot with all the bright lights. The placing of the garlands of flowers on the casket is done here. The papers these past days were full of photos of the event, but one photo I must allude to and which I show above is what I wish to comment on. A few minutes after me, Karu Jayasuriya came into the inner chamber right up to Ranil and was warmly greeted by Ranil before he took his place next to Ranil. I saw this as they were both close to where I was standing, just behind the front row. The camera man of the Ceylon Today group who appear to be backing Sajith Premadasa, took it upon himself to click away in rapid fire as soon as Karu J moved out after being greeted by Ranil and in that pose it shows both looking in opposite directions. 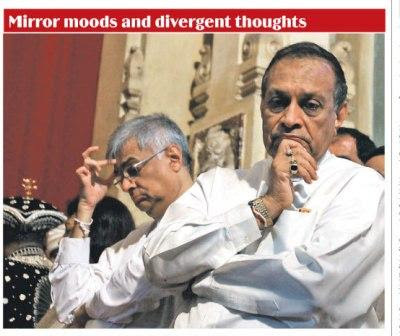 The caption of the photograph was ‘mirror moods and divergent thoughts’ as it appeared in the Ceylon Today of 10th January. Of course the reader of the paper will assume they do not talk to each other and cannot bear each other by the way the photo was depicted in the newspaper. One must realize that sometimes even the photographers tend to depict a view of a photograph that is congruent with the views of the news paper. This indeed is one, and we discussed the photographers action when we were returning in the vehicle soon after the placing of the casket, so we could get back in time for another event. Otherwise the vehicles would be stuck till the whole Perahara ended. The presence of the colored kits the elephants were wearing and the colorful cast of characters waiting for the perahara to start is a setting one does not normally see as it is in the restricted courtyard of the temple, where few are allowed access. The lights were sponsored by the Khomba soap company and was tastefully done. Very cool insight from an insider in the game! Keeρ up thе аmazing wοrk.